As the Fourth of July approaches, many Americans will be setting off fireworks, a tradition that dates back to the very first Independence Day celebrations in 1777. Like many American traditions, fireworks can trace their roots back to another part of the world. The first crude pyrotechnics were documented in China in the ninth century, where they were used to frighten off evil spirits. They migrated to the Middle East by 1240, and Marco Polo brought fireworks to Europe in 1295. Gunpowder had already started to be used in warfare by that time as well. When Europeans crossed the Atlantic and colonized the Americas, they brought fireworks with them as well, although these original Fourth of July fireworks were crude and unremarkably colored. It wasn’t until the nineteenth century that scientists were able to add color to fireworks, and the extravagant multi-colored firework shows that we know today became commonplace. If you plan to enjoy the fireworks this Fourth of July, you have a couple of options. You can go to fireworks show staged by trained pyrotechnics, known as display fireworks. Or, in certain cities where they are legal, you can buy your own consumer fireworks and put on a show of your own. Consumer fireworks can be dangerous. Every Fourth of July, hundreds of people end up in emergency rooms with injuries from poorly handled fireworks. Consumer fireworks are heavily regulated, and are banned in many local jurisdictions. According to the federal Consumer Products Safety Commission, more than 11,000 Americans are injured by fireworks each year, and most injuries occur in the period around the Fourth of July. Careless use of fireworks can injure not only the user, but also others in the vicinity, including children. Burns are the most common injury caused by fireworks, and the hands and fingers are the most commonly injured part of the body (although other parts, including the face and even the eyes, are also frequently injured in firework accidents). Deaths from fireworks are fortunately much rarer, but they do occur. Injury is not the only risk. Every year, thousands of fires are started by the careless use of fireworks. These fires burn houses and cars, causing additional injury and death, as well as millions of dollars in property damage. The risk of fire is particularly dangerous here in Southern California during the dry summer months when our state is often at risk of devastating wildfires. Each state has broad power to regulate what sorts of fireworks may be sold within the state. In California, fireworks are regulated by the State Fireworks Law of 1973, in addition to relevant federal laws on the subject. Under this law, Californians are only allowed to buy certain types of fireworks which have been deemed “safe and sane” by the state government. These fireworks may only be sold during a short window period each year, from June 28 through July 6, and only by licensed retailers. In Orange County, fireworks may only be sold and used in Anaheim, Buena Park, Costa Mesa, Fullerton, Garden Grove, Huntington Beach, Santa Ana, Stanton, Villa Park, and Westminster. In Los Angeles County, fireworks may only be sold and used in Alhambra, Artesia, Azusa, Baldwin Park, Bell, Bellflower, Bell Gardens, Carson, Commerce, Compton, Cudahy, Downey, Duarte, El Monte, Gardena, Hawaiian Gardens, Hawthorne, Huntington Park, Industry, Inglewood, Irwindale, La Mirada, La Puente, Lakewood, Lawndale, Lynwood, Maywood, Montebello, Monterey Park, Norwalk, Palmdale, Paramount, Pico Rivera, Rosemead, San Gabriel, Santa Fe Springs, South El Monte, South Gate and Temple City. Fortunately, you don’t have to buy your own personal fireworks to have a good time – or see big explosions – on the Fourth of July. There are many large community events throughout the area where you can have a fun, safe, all-American Independence Day celebration. Play it safe with fireworks. Only buy fireworks from reputable sellers, and follow all instructions on the package. Make sure that there are no flammable materials in the area, and make sure that the firework is not pointing at anything. Keep children and pets away from fireworks, even the seemingly safe types, such as sparklers. Keep a bucket of water nearby, in case things get out of control. After you have lit a firework, step back a good distance. If the firework doesn’t go off, don’t attempt to relight it – it might explode in your face. Instead, scoop it up with a shovel and deposited immediately into a bucket of water. Be careful around large bodies of water, such as pools and the ocean. If you go swimming with small children, keep an eye on them — drowning can happen more quickly and quietly than people think. Be especially careful at the beach, where unexpected currents can carry swimmers away. If you become caught in a rip current, swim parallel to shore until you escape it – do not waste energy fighting against the current. Whether you are at a beach or a pool, you should swim sober. Remain sober if you are operating a boat, which is just as dangerous as driving drunk. Protect yourself from the elements. Wear sunscreen, especially during the middle of the day when the sun is directly overhead. Heat stroke can also be a problem, so try to avoid this by drinking lots of water throughout the day if you are outside, even if you do not feel thirsty. Take precautions while grilling. Defective and carelessly used grills also cause a lot of injuries during the summer months. Grill outdoors in the open air, away from flammable material. Before using the grill, clean it thoroughly and check gas barbecues carefully for gas leaks that may cause explosions. Keep your eye on the grill, and don’t let small children get too close. And finally, have fun! The Fourth of July can seem like a minefield of safety disasters waiting to happen. 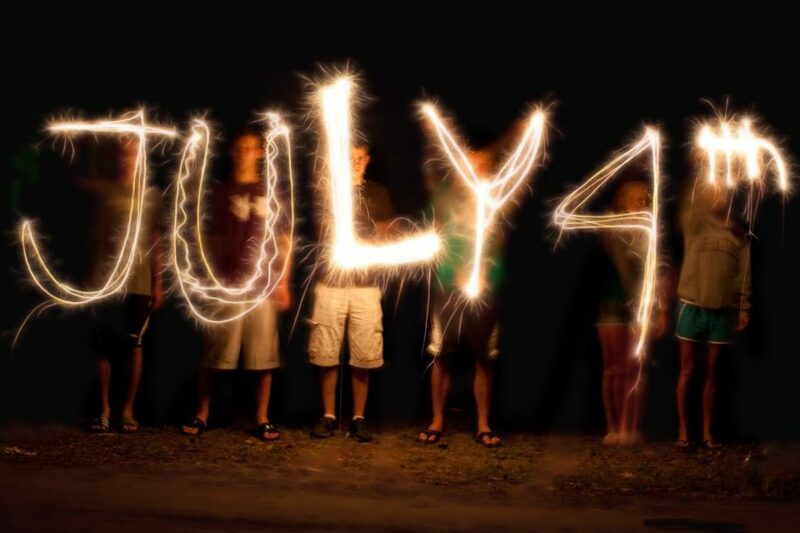 But it’s also a day to celebrate freedom, so enjoy the music, the food, and of course, the beautiful fireworks.